Page 60 — Perhaps they need to match the tune, too? Hey folks! I’m posting a bit early this week, because by tomorrow afternoon, I’ll be on my way to VanCAF — the Vancouver Comic Arts Festival! If you’re in Vancouver, drop by (it’s a free festival) and see me in Hall 1 at table G3! 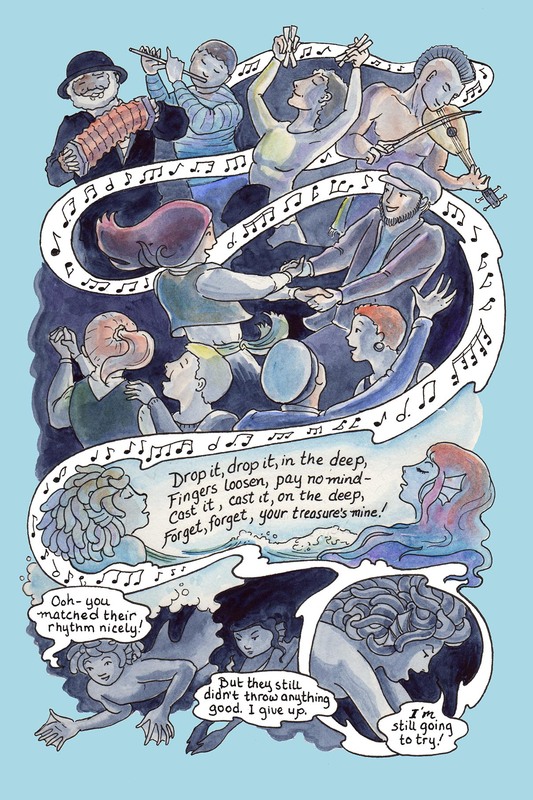 Tell me you follow this comic and get a free postcard map of the world of Mermaid Music, and a big grin from me! This comic was posted in Mermaid Music and tagged comic, dancing, graphic novel, merfolk, mermaid, mermaid comic, music, musicians, sailors, sea comic, ship, watercolour, webcomic.